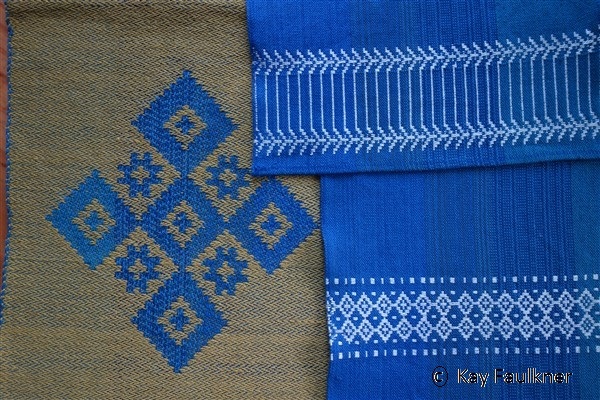 The past few blogs have been exclusively about my textile trip to Laos/Cambodia earlier this year. Just because I haven’t been talking about what has been happening in the studio, doesn’t mean that nothing has been happening. The following are some of the highlights over the past few months. 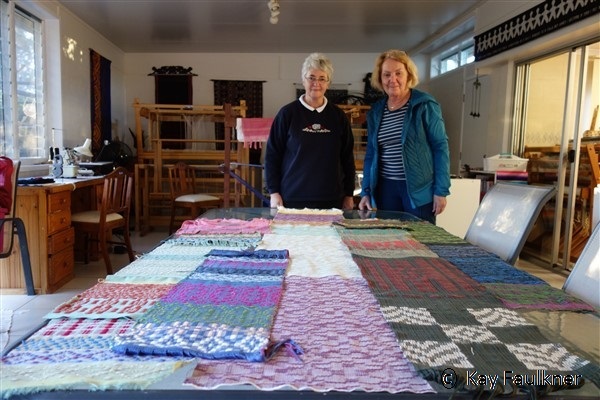 Back in the February blog # 2, I wrote about Joan who was visiting Australia from Hawaii and extended a holiday to explore waving on a draw loom. 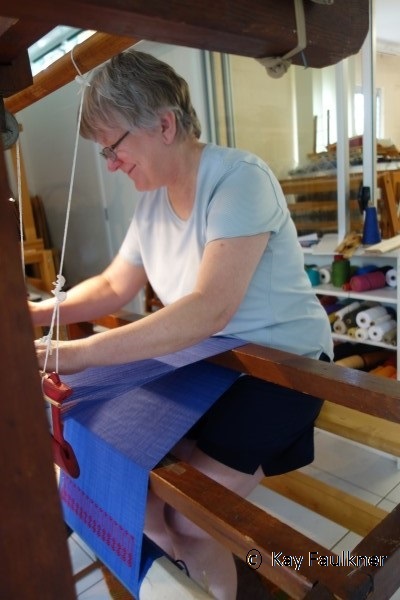 She managed to get totally fascinated by the process and has since acquired her own loom. Now that is a great result! I’m mentioning that because it also gave me the perfect opportunity to explore an idea. 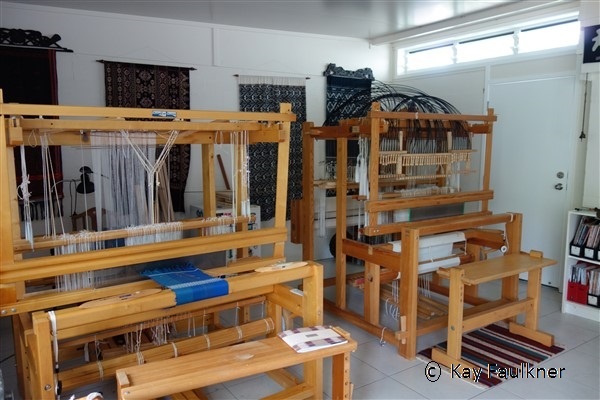 Beside the draw loom (on right), I set up a countermarche loom so that it was a cross between a draw loom having long eyed short heddles at the front and a Laos loom with vertical storage at the back. Having the two looms side by side was an interesting juxtaposition. 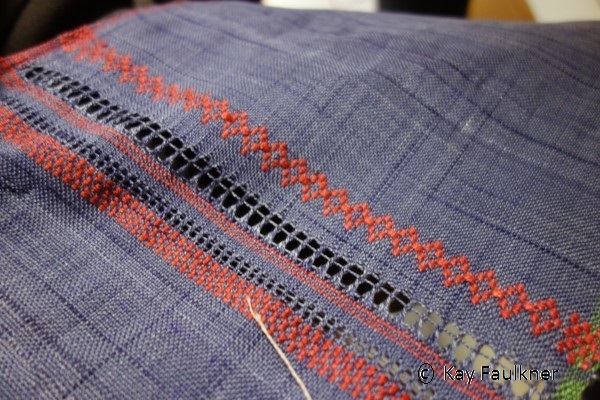 I did like the potential of weaving similar cloth on both looms. Over a period of time, I had noticed many similarities between the functioning of the Laotian (or any S.E.Asian loom) and the draw loom. 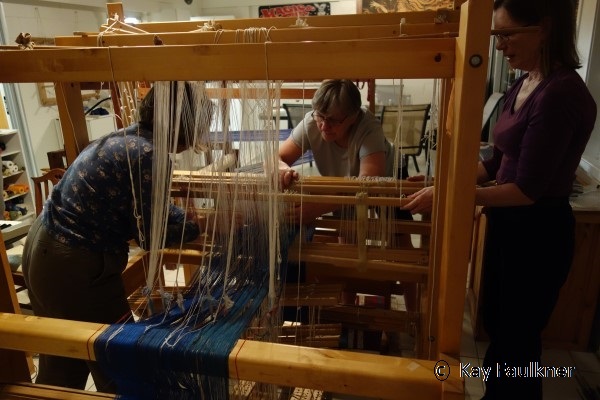 This was my opportunity to explore what a hybrid loom could do. Damask is being woven on the hybrid loom. I have 6 shafts set up for a 6end damask on the front and the stored pattern operating as the pattern shafts at the back. 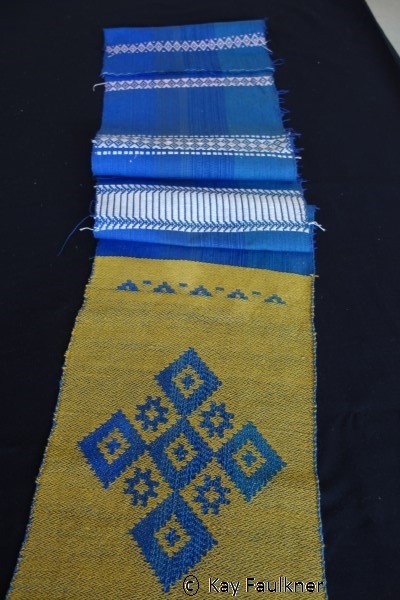 As in conventional Laotian weaving, the pattern is picked up and stored. In this case however the block patterns are being stored. The stored pattern is then used in much the same way as a pattern shaft on the draw loom – raised for the 6 rows of a 6 shaft satin. And just because I could do it, I also wove a supplementary weft pattern on the same warp. 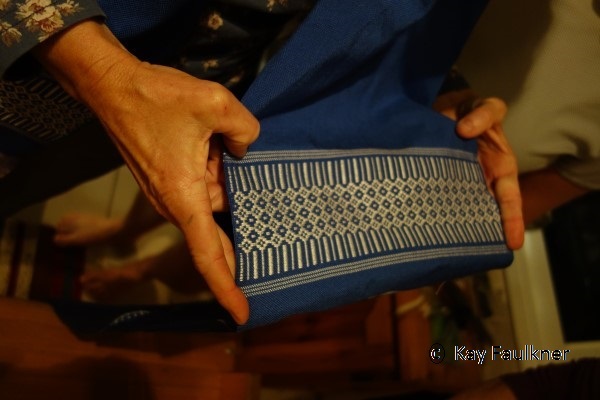 All the patterns that I have used are from “Lao Motif”. I will return to this as there’s much potential and it’s such a fun challenge to do. However a group was arriving in the studio. 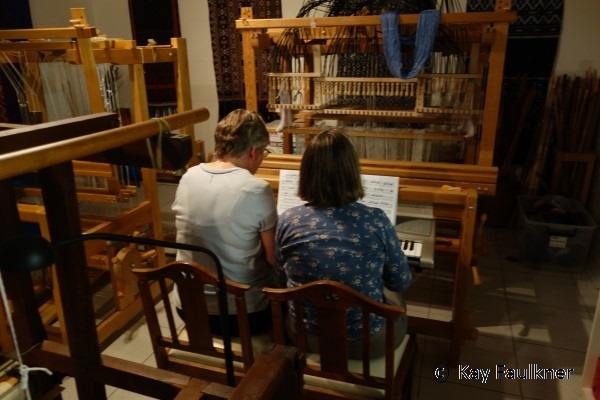 Every two years a group of like-minded weaving mates get together with the challenge of playing and exploring any technique or structure or in reality anything relating to weaving. There’s discussion and a whole lot of fun to go with it! It’s a highlight of a diary and something to look forward to. It’s been going on quite some time and we’ve had several. Sometimes everyone can come, other times there are fewer. This time it was my turn to play host. (Normally I have to go to USA or Canada). 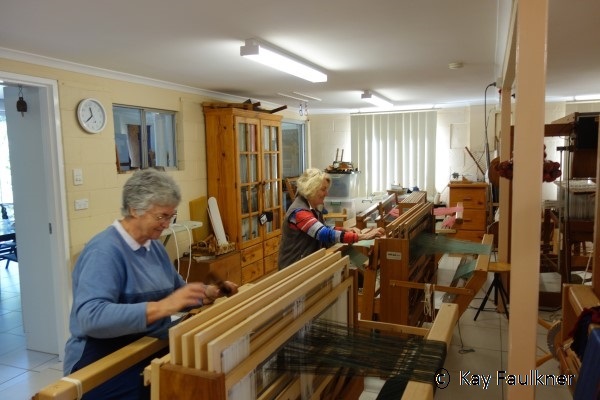 Three weavers came to Australia: Kathy, Jette and Bev. By chance they all decided that they needed to play with my Laos equipment. So there was one traditional Laos style loom and two countermarche looms with Laos vertical storage units. 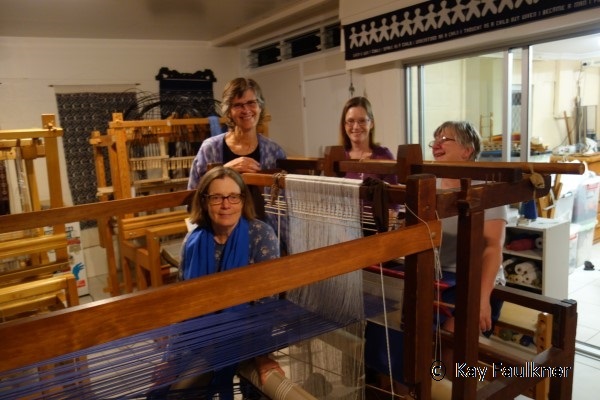 Weaving mates from three countries: USA, Canada and Australia. We all wove. 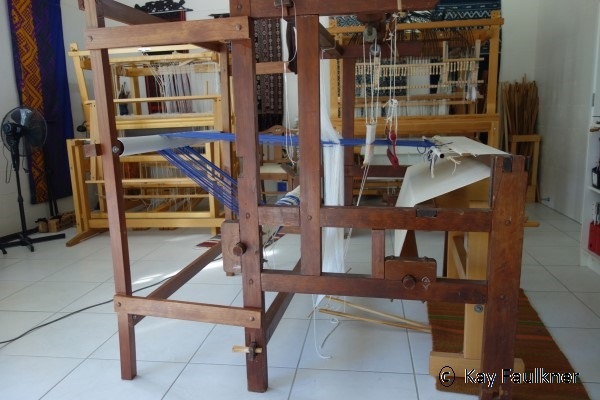 Here are three “Lao” looms in action. 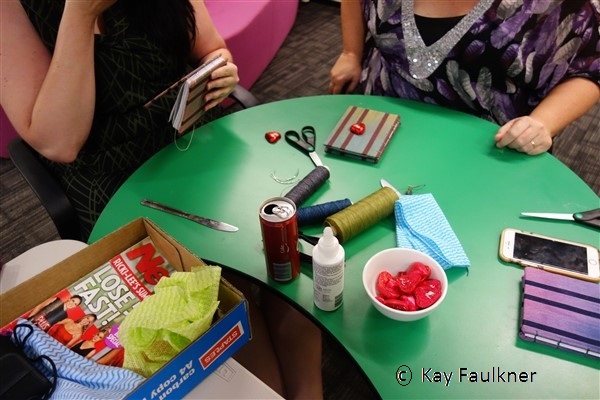 There was much group problem solving…..
….and fun. Part of the experience was the duet. They’re chalking up how many places (Towns, States and Countries) they can play together in. I got to play i.e. get around to doing, something that I’d been wanting to do for some time. Keeping in the theme of bands of pattern, I explored structures on my 24 shaft computer assist loom. And at the end of their stay, I have even more potential for play as now I have three looms with warps for me to weave on. I can go back to my damask/supplementary weft (the original hybrid loom). I also have the original Laos loom. I decided it could do with an adventure with a saw. As I am not using it any more with a warp in a bag at the front of a loom, I don’t need all that length. I am using a western style back warp beam to store the warp. I have found that it is much easier to achieve even tension. All I need is a length to allow movement between the vertical storage and the front plain weave/ground shafts. So saw in hand, it is now shorter and taking up much less floor space in the studio. But I also have a loom with a ground of overshot. That was a careful bit of planning as now it’s so conveniently set up in time for a 5 day workshop: Beyond the Basics. Ronda and Jan came to explore profile drafting and converting it into basic weave structures: 4 and 8 shaft forms of Overshot, Crackle, M’s and O’s and a combination of Summer and Winter and a simple lace. It was a very productive week and as well as going home with a whole lot of samples, they’d woven on several different styles of looms including the 16 shaft computer assist and had a portfolio of drafts.Here are some of their samples. And I still had a bit of warp left on the Overshot/Laos loom. I have plans! 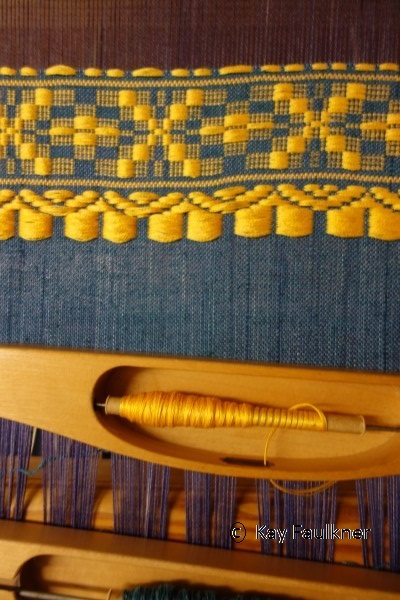 I can weave a border with both a finer supplementary weft design in the style of Laos patterning and a larger overshot one. Here it is with the pattern being developed. It is being woven upside down with these long floats to be on the back. 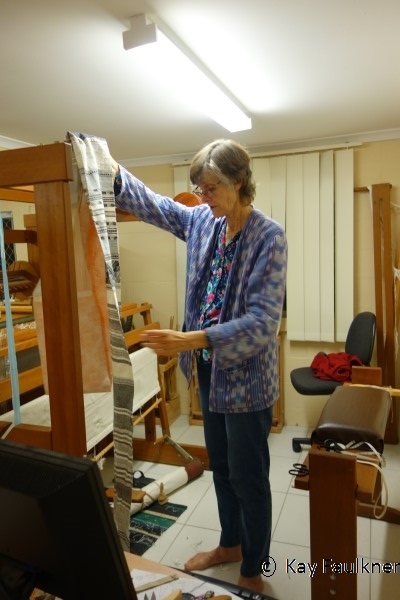 In addition to weavers working in the studio, I have had a bit of life on the road. 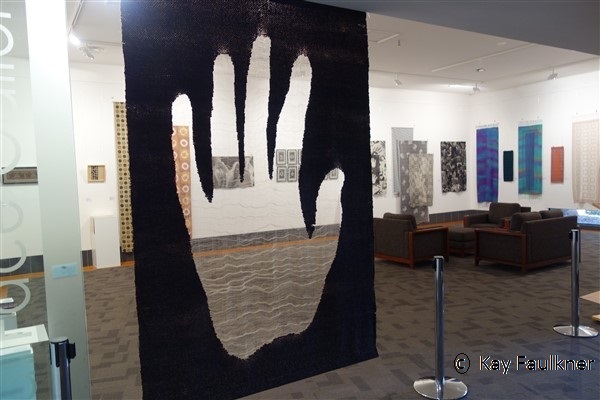 My touring exhibition Pattern; A Universal Phenomenon had an outing to Moranbah. The exhibition looked fabulous and was extremely well received. But then Cyclone Debbie came and Central Queensland was flooded. Demounting couldn’t happen. The town was cut off. Eventually the roads got reopened and life returned to ‘normal’ for that community. I am pleased to report that while the town was flooded, no one was hurt. The upside was that the exhibition had an extended life of an extra month. Pattern has one last showing to complete the touring program. It will be in the Childers Art Space from 15 July to 3 September. Coming up is another exhibition: Stitched up. I was delighted to be invited to be part of this exhibition. I will report on that process of producing that work and the background behind my concept for the work on the next blog. In the meantime here’s a link to the exhibition. This is the final post on my textile tour to Laos and Cambodia in January/February 2017. Siem Reap is the place to stay when you go to see Angkor Wat. Angkor Wat is both a significant tourist destination, an engineering marvel from the Khmer Empire and an extremely significant Buddhist temple complex. For those who go to Angkor Wat (and there are busloads!) keep your eye out for pattern. However the reason I was there was of course to check out some textiles. I had heard of some places where textiles could be found and that there was lotus fibre produced in the area. I also discovered others while I was there. For those places off the known tourist trail, I would recommend that you take with you the address and the phone number of your destination to give to a tuk tuk driver. Our driver was very obliging and willing to find out where these places were, often with a group discussion with a group of drivers. However we did also end up in interesting places. Prof Charu Smita Gupta with Libby, Truda and I in the entrance at MGC. Photography is not allowed in the galleries. Artisans of Angkor is on the tourist map. It is also a destination for school groups and that was very pleasing to see. On site in Siem Reap are some working studios as well as the gallery. The work in the gallery is exquisite and well presented. The working studios included carving on wood and stone, metal working including silver plating, lacquer work, jewellery, gold leaf and painting. There was a very sad static display of a loom to represent weaving. The threads were broken and the loom looked as if it couldn’t even work- not a very good advertisement for weaving or for weaving as representative of this place. Students watching stone carvers at work. The loom at Artisans of Anchor- not a very attractive example of weaving. However if one has time I would recommend a visit to their offsite complex where the process from spinning through to weaving is very well represented. It certainly wasn’t clear at the facility in Siem Reap that this would be the case. There is very beautiful work produced here. Silk being reeled from the cocoons. 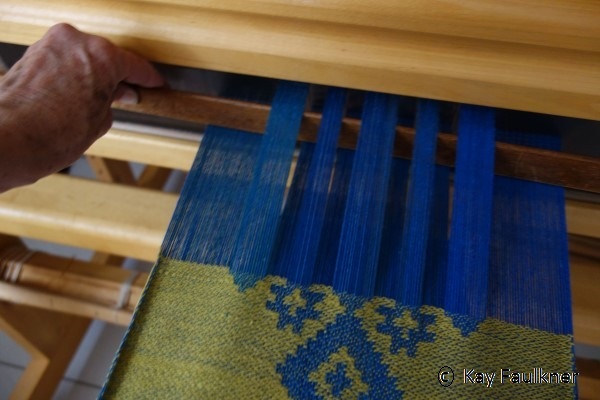 An example of weft ikat being woven. The space housing many looms. It was extremely noisy. Documentation of the natural dyes that are used. Fabrics being woven with natural dyed yarn. Complex weft ikats were also being tied and woven. 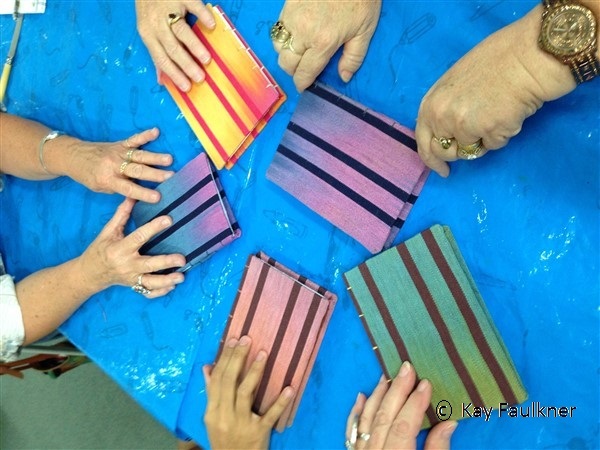 Here the ikat is being rebound after the first dye bath. An example of ikat after several dyebaths. 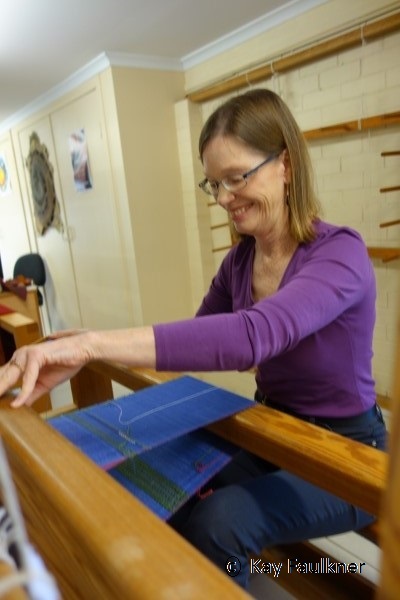 I had heard about Lotus textiles before I had come to Cambodia and had spoken to Carol Cassidy about the yarn so some serious research came into play. There are many lotus farms. We even stopped and walked on boardwalks through the lotus. All stages of the process is well documented. We saw how the fibre is actually produced. After harvesting the lotus stems are cleaned. The fibre is extracted by breaking the stem and pulling out the fibre. 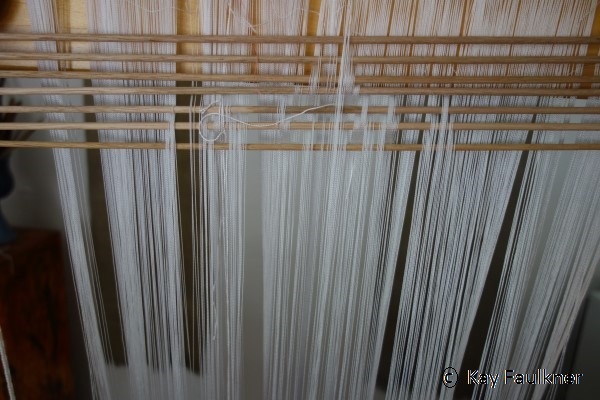 Several fibres are then twisted together to make the yarn. Many hands are required to extract a small amount of yarn. As each length is twisted it is collected in a basket. This yarn is then taken and skeined. There were looms here but we didn’t see any weaving being done. Closer to Siem Reap was the headquarters of Samatoa. Here it was obvious that negotiations were undertaken for commissions in lotus cloth. We saw some examples of it being used in combinations with other yarns and test samples of woven fabrics. The lotus yarn is extremely expensive so combining it with other yarns makes sense. I must admit that the yarn itself is not necessarily inspiring (it has no lustre) however it is extremely valuable because of the limited quantities produced. It is marketed as a sacred fibre. Originally it was used to weave Buddhist monks’ robes. Samatoa also produces handwoven silk cloth. The following are some additional observations that I found interesting. 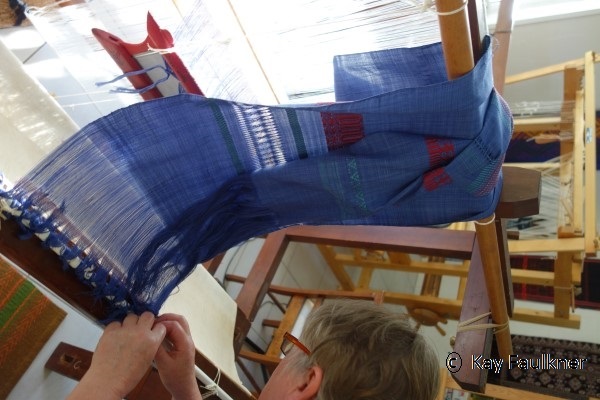 I found the contrast between the speed used in weaving plain weave cloth and the slower approach to weaving ikats of interest. This was extremely evident at Artisans of Angkor. What is also of interest is the variation of the treadles to what we would normally use.It appeared that these treadles were standard in this area. You can see them in the movie. Here’s another examples at Samatoa and IKTT. 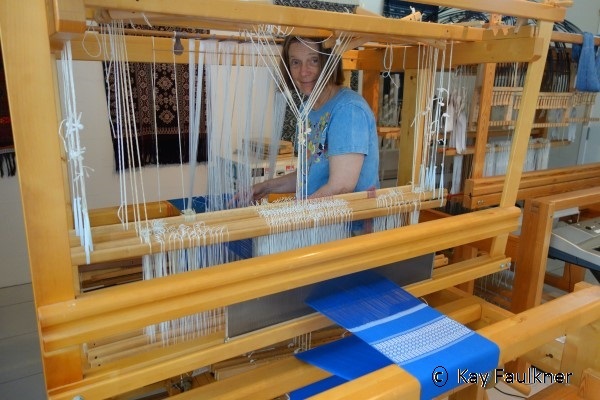 Note the use of two hanging devices either side of the loom that hold the shafts up while they are needed for weaving. 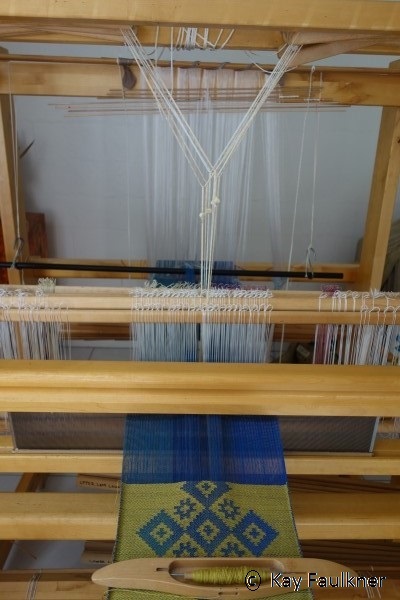 Complex twills can be woven using this system. It require two shafts that are treadled in combination with extra pattern shafts. The two treadled shafts are behind the ones that will be picked up. The operation of this system can also be seen in the movie. 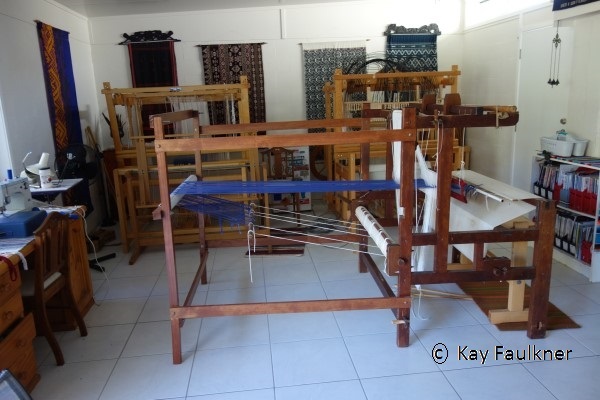 This is the final installment of the textile tour to Laos and Cambodia. Meanwhile in the studio much has been happening. The next blog will attempt to catch up on that. You are currently browsing the Kay Faulkner's Blog blog archives for June, 2017.